Following World War II, many cities of Europe found themselves nearly unable to continue. The rain of bombs and shelling leveled everything. An American Newspaper Columnist, Drew Pearson, wrote an article depicting the hardships Europeans were still enduring. This time instead of the military leading the march, the people of America banded together behind Drew Pearson and delivered more than 250 railroad cars of aid to the people of France. Less than a year later, word got out that France was planning a train of her own. When it arrived, there were (forty-nine) 40 & 8’s carefully packed full of amazing treasures. For a country who had nothing to spare, France generously gave what was most dear to their hearts, and placed their items on the train as it passed through their town. A list of items would include: wooden shoes, toy Renault cars, wedding dresses, war medals from dead husbands, brothers and sons, children’s dolls, games, brass trumpets and the list goes on. The people of France showed a grand generosity. The 40 & 8 Boxcar got its name from its use during WW I and WW II as a cargo space large enough to carry 40 men or 8 horses. 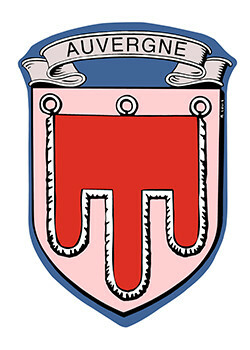 The white and gold bands on the coat of arms are symbolic of the former Lower- and Upper-Alsace departments in the province. 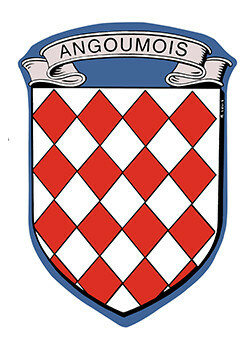 Occupied by Gallic peoples in pre-Roman times, Angoumois was originally part of Charlemagne’s empire. 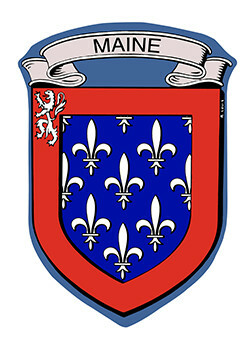 The red border on this shield indicates it was an inherited fief, and the fleurs-de-lys (the royal banner) were added to show Anjou’s annexation to France. 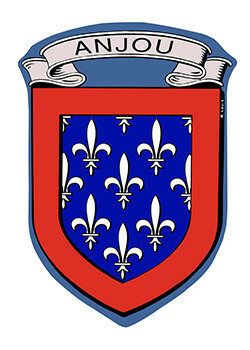 Designed 400 years before Artois became a French province, the nine castles on this shield indicate Artois’ feudal lords at that time. 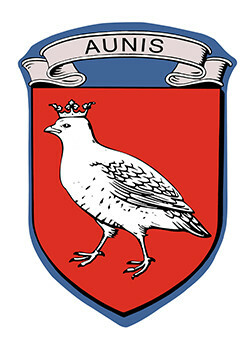 The shield of Aunis, Incorporated into the French crown lands in 1373, features a crowned partridge for which no origin explanation exists. The three-pointed banner on this shield was won by crusader Eustace III, when he conquered Jerusalem in 1099. 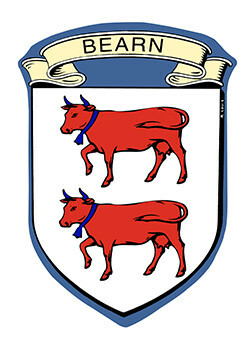 The cows represent the ancient Iberic tribe of Vacceans, said to be the ancestors of the Béarnais. 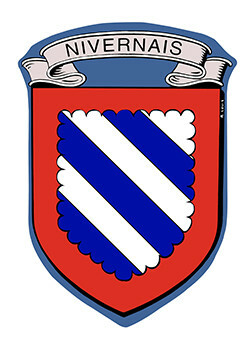 The scalloped, or invected, border on this shield indicates Berry was an inherited fiefdom. 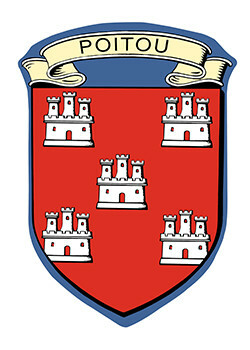 The diagonal “riband” on this shield may represent knighthood or a ladder for scaling fortification walls. 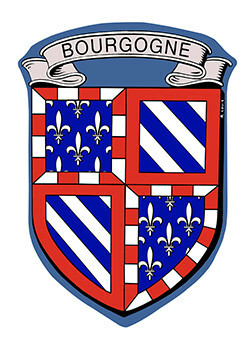 This shield is “quartered,” representing the first (diagonals) and second (fleurs-de-lys) ducal families to rule Bourgogne. 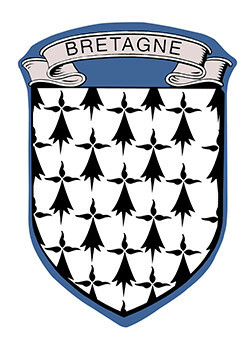 The black, tree-like shapes on this shield represent ermine tails, suggesting the expensive furs worn by medieval nobility. 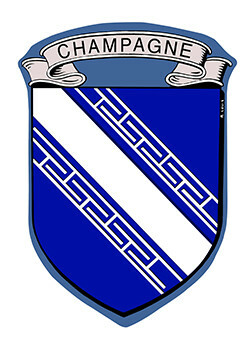 Troyes, capital city of Champagne, takes its name from ancient Troy. The intricate diagonal pattern on this shield mimics mazes built in Trojan settlements. 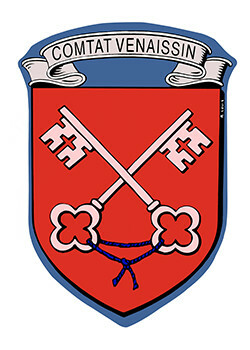 The keys are St. Peter’s keys, and refer to the spiritual and temporal powers linked in a single hand, reflecting the province’s 500 years as a papal enclave. 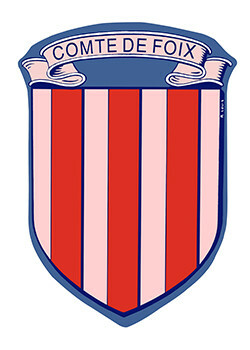 The vertical colored stripes on this shield may represent strips of metal attached to the original shield, giving it greater strength in battle. 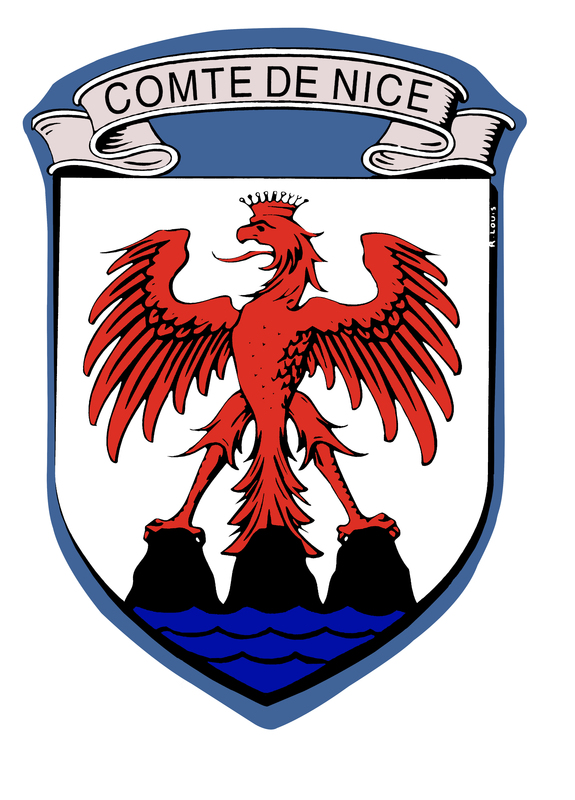 The eagle represents the Holy Roman Germanic Empire, and the rocks are three mountains that surround the city of Nice: Mts. Alban, Gros, and Chauve. 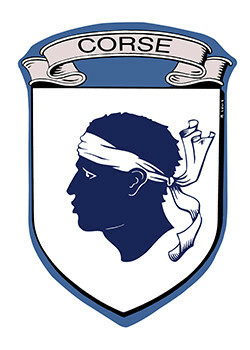 The Moor’s head fits the traditional description of Moors who once occupied parts of Spain, the Mediterranean shore of France, and several Corsican villages. 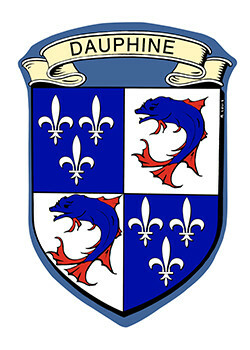 This “quartered” shield represents the royal banner of France (fluers-de-lys) and the Dauphin (dolphin—“king of fishes”), eldest son of the French king and ruler of the province. 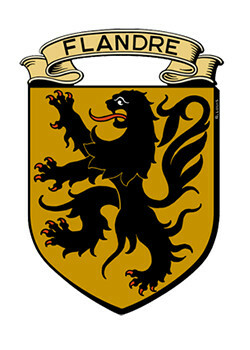 During the Crusades of 1177, Philip, count of Flandre, captured a banner bearing a black lion in a victory against the Saracens. The lion, king of beasts, was a favorite symbol among fighting men, and this province saw a lot of fighting. The Romans, Franks, Germans, Swiss, Spanish, and French all fought here. 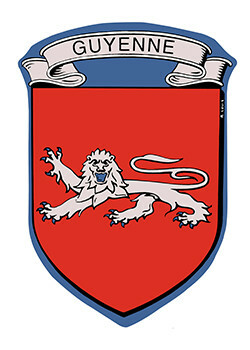 Provinces were obliged to have coat of arms and to pay for their registration. 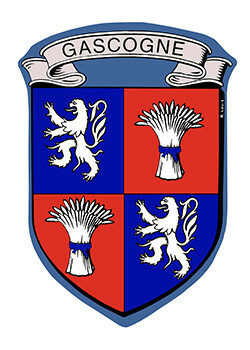 Louis XIV granted this coat of arms to Gascogne, in 1696, as a way to raise funds for war—it has no historical significance. Whereas the standing lion on some shields is rearing up, ready to fight, this shield features a leopard on guard. 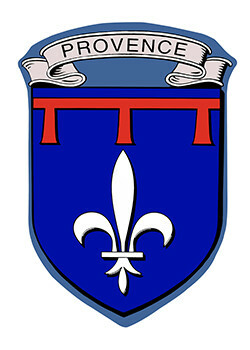 Pays de-France became the nucleus of the crown lands when Hugh Capet, Count of Paris, became the French king. The name was changed to Île de France in 1387. The cross on this shield is the Cross of Toulouse, possibly a modification of the Latin Cross attributed to the crusades of 1099. 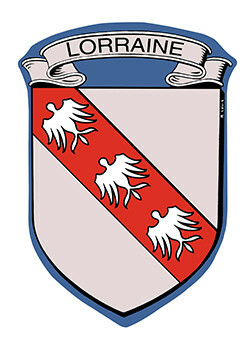 Based on legend, the three birds on this shield were killed with the same arrow by Duke Godefroi, during the siege of Jerusalem in 1099. It was considered a good omen. In the thirteenth century, the merchants’ guilds revolted against the power of the Archbishop-Count of Lyon. They used a lion on their banners to express their own strength. 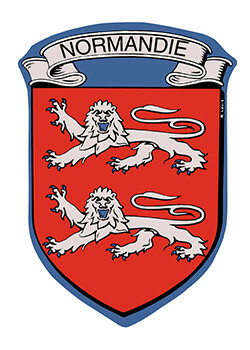 This coat of arms was adopted from the province of Anjou, the small lion was added to indicate the influence of the English Plantagenet royal family. 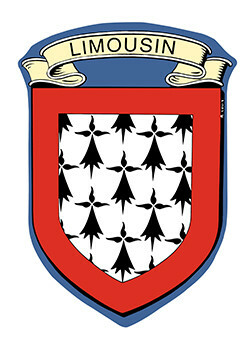 Used around 1360 by Count Jacques, who inherited the fief, this shield combines the royal banner with three lions from the old arms of the province, those of the Lusignan family. Originally part of a Basque region in both Spain and France, a portion was united with Béarn into a French province, retaining the gem and chains symbols from the Spanish national coat of arms. 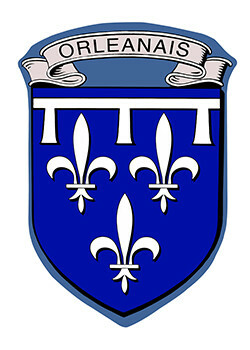 This coat of arms is said to have been those of Guillaume (William) le Bâtard, the duke of Normandie, who defeated the English at Hastings and was crowned king of England in 1066. 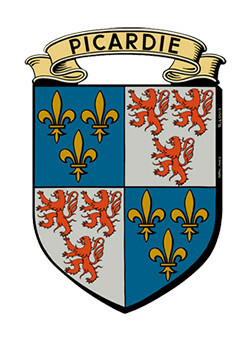 In 1344 the king of France, Philippe de Valois, granted Orléanais to his son, Philippe. 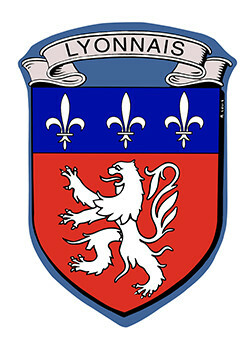 This shield carries the royal banner (fleurs-de-lys) and a white ribbon, indicating the inheritance. 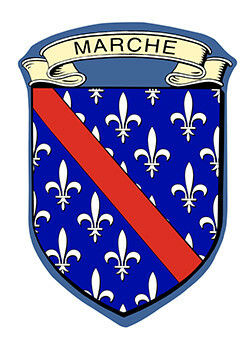 This coat of arms is shown “quartered,” containing arms of the original region of Picardie with those of both Île de France and Buorgogne. 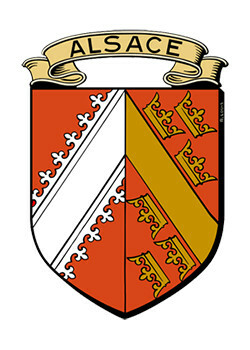 Poitou was given to Alphonse de France, Count of Toulouse, by his father, King Louis VIII. 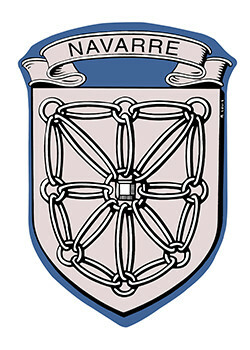 This coat of arms comes from his mother, Blanche of Castille (Spain). These arms are a simplification of the arms of Charles I d’Anjou. He was count of Anjou, Maine, and Provence, as well as King of Sicily, Naples, Albania and Jerusalem. The four red stripes on this shield recall the province’s years as a Spanish possession. 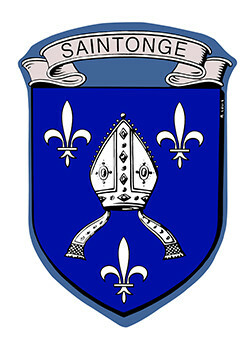 The bishop’s miter refers to St. Eutrope, first bishop of Saintes and apostle of Saintonge, martyrized in the third century. 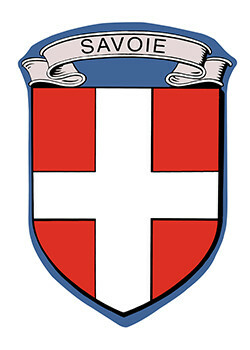 Called the Cross of Savoy, these arms may have been given by the pope to Amédée of Savoy when he was sent to fight in the crusades. 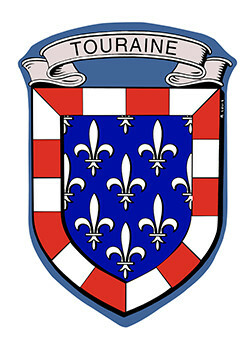 Philippe le Hardi was granted both Touraine and Bourgogne. That is why the arms on this shield are also the first and fourth quarters of the shield of Bourgogne. 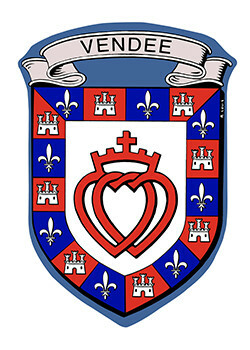 The Sacred Heart of Vendée was used as an emblem during an insurrection between 1793 and 1796. 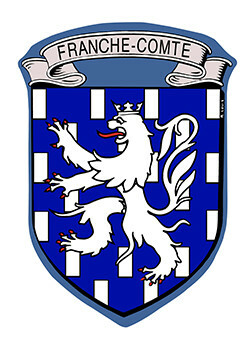 This coat of arms was adopted in 1943 for Vendée, a department of Poitou.